QUOTE: "We will NOT fall for your schemes." There is a boundary of thick forest that no one from Gojinn's village has crossed for many decades. Gojinn's people tell stories of another village far on the other side of their island, but contact with them is strictly forbidden. The stories passed about this village describe the other village as a place of aggression and hostility. A place full of people not to be trusted, and to be avoided at all costs. In that village, their stories describe Gojinn's village the same way. The curious fact omitted by the ancestral lore of BOTH villages, is the distinct difference in the colors of their skin. 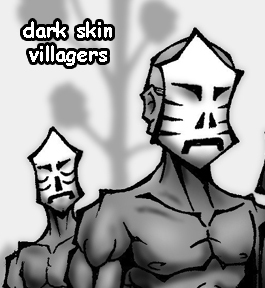 In Gojinn's village, everyone's skin is light. In the far village, only dark. The truth is that the two villages are alike in nearly every way. They hunt the same types of animals, using weapons made from similar techniques. The way they wear their clothes may appear different, but both villages created their fabrics from the same methods. And certainly the people of both villages hold the same fears. One of these fears is the "Mark of the Jinn." 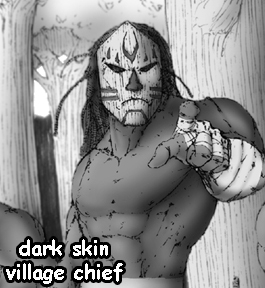 Just as Gojinn's village turned against him for bearing the cursed mark, so too did the dark skinned warriors turn on Ningai.